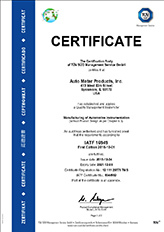 Welcome to Auto Meter Products, Inc. and our custom solutions business. We offer customized instrumentation solutions to the Original Equipment market, and pride ourselves on the quality, accuracy, cosmetics, and service excellence that we offer our OE customers. We are an IATF 16949 certified company and currently serve a broad customer base including partners in the Automotive, Motorcycle, Power Sports, Commercial Cooking, and Industrial segments. We are an active partner, with a strong engineering team that enjoys working with our customers to develop custom solutions to their unique application and marketing needs. We look forward to working with you. We have many resources to draw upon to address your unique needs.